News & Events Seminars Joe Warren, Ph.D. Active and passive acoustics can provide high-resolution (in both space and time) data about marine ecosystems. However, converting acoustic data from volts and dBs to units that are important to an ecosystem (number of fish, vertical distribution, diurnal behavior) can be a challenging endeavour. 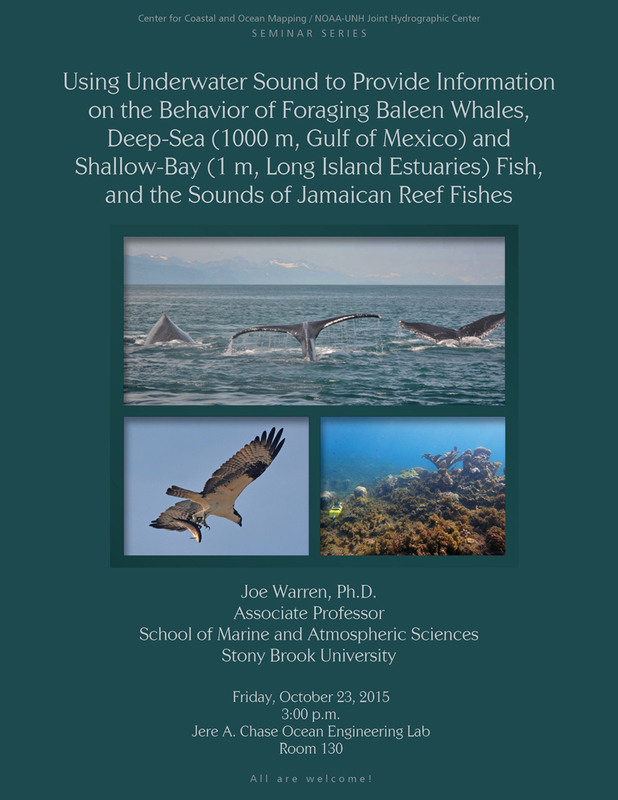 This talk will cover several different studies where acoustic techniques provide unique insights into the following ecosystems: foraging behavior of humpbacks and the endangered North Atlantic Right whale; identification of the species composing the deep scattering layers in the Gulf of Mexico; quantifying how many forage fish are in a coastal estuary, and tropical fish herbivory in Jamaica. Joe Warren is an associate professor in the School of Marine and Atmospheric Sciences at Stony Brook University. I was an undergraduate engineering major at Harvey Mudd College (BS, 1994) and received a Ph.D. from the MIT / WHOI Joint Program (2001) where my thesis focused on using active acoustics to measure zooplankton populations in the Gulf of Maine. My primary research interest is in using acoustics to better understand marine ecosystems, in particular zooplankton and nekton ecology. I also claim (completely unsubstantiated) that I've used an underwater echosounder at a higher elevation (7000+ ft above sea level) than anybody else in the world.